To answer the question if you should wear a swim cap, let's first think about why you are swimming and to what purpose would the cap be to you. So why do you swim? If you are out there stroking from one side of the pool to the other for fun or great exercise and you have short hair, buying a swimming cap could be an overkill, therefore not necessarily something you'd need or enjoy. Only thing you need is a swim suit and and some decent goggles and you are set. On the other hand, if you are out there to become a competitive swimmer or you are already competing, it could be beneficial for you to wear a swimming cap and spend some time researching the types of caps that are out there. 1) Do you have long hair? If so, I'd suggest you do wear a swim cap as it is very hard to swim with the right technique, with the right head position while trying to lift your head to keep the hair out of your face. Also, some folks say that using a swimming cap does prevent your hair from chlorine damage, but I wouldn't think too much about to this. Chances are, you don't spend 40hrs a week in the pool for your hair to get damaged anyway, so you are safe there. 2) For the group of you that will be swimming in competitions and you don't suffer from long hair disease :), I'd suggest you DO NOT wear a swim cap in your regular swim practices on most occasions. The reason for this is that you want your time spend in the swimming pool practicing to be harder and with more drag than while you are racing. Your head without a swimming cap, has ears flopping around and more pores, so the drag is much higher. If you work harder in practice, just by having more drag, your racing will feel much faster. So, to keep your drag larger in swim practice, stay away from swim caps. Not to be confused with minimizing resistance while swimming. 3) There are times in swim practices, however, that you should swim at competitions speed and practice certain things you will do in your swim meet. For example, practicing relay starts, relay exchanges, starts, turns or plain all-out sprints. During these activities, you might want to consider wearing a swimming cap as it gets you used to the feeling which you will have while competing. When you swim with a swimming cap, your body and head feel a bit differently than without swimming cap. Because you have less drag with a swimming cap, you will glide further in streamline positions and could go much deeper into your starts etc. So, practicing these with a swimming cap once in a while, before you go to your main swim competition is a good idea. 4) If you are an open water swimmer or do swim often in a very cold water, it is a very good idea to wear a swim cap as it helps with keeping your body heat. Most of your body heat usually escapes through your head, so by placing a swim cap on it will keep you warmer for longer. On the other hand, you can also easily become overheated in a warmer pool, so be careful. 5) If you think swim caps are uncool and you are out there to make a fashion statement by not wearing a swim cap, then think again as swimming caps come in a huge variate of colors, designs, materials, you can even design your own swimming cap, so don't worry about the way you look and get the cap that serves your purpose. 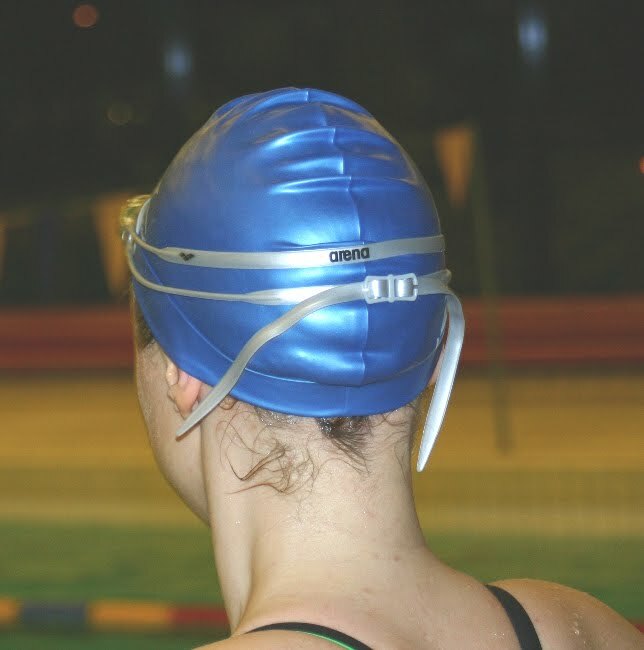 As mentioned above, there are swim caps made from many different materials. They range from lycra to latex and to silicon caps. If I have to give you just one advice about swimming caps, DO NOT buy Lycra caps. Pardon my french, but they are just dumb. First, they add more drag, they will not stay on your head and they will definitely not protect your hair from chlorine. 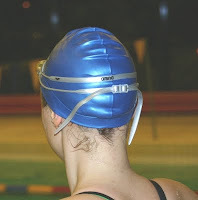 For everyday swim practices, it is better to invest in latex or silicone caps. Latex caps are cheaper, but they do not last very long so it could be better to invest in silicone type cap. However, be careful that the cap is not very tight on your head as your ears will start hurting after few minutes in the pool. From my personal experience, I'd suggest Latex caps for practice swims. Finally if you are after a minimal drag in the water, the newish no-crease swim caps which are very smooth might be the way to go for you. Another reason to wear a swim cap is when you are swimming in open water and there is a danger of being hit by a boat or a windsurfer's board, a brightly colored swim cap will make you more visible and decrease the risk being hit. Always wear a swim cap when swimming especially in a pool from a hygiene perspective. Have you ever looked in the plug hole after washing your hair? Think what it's like with hundreds of people per day swimming through the pool. If you don't believe me, ask the pool attendants if you can look at the filters! It's also not pleasant for those swimming behind to take in a mouthful of hair, be it long or short! yes I agree with the fact that precaution is very important while we practice any sports. Wearing safety gear is really important. Should male swimmers be required to wear swimming caps with their costume? @anonymous: in majority of swimming pools there is no requirement to wear a swim cap for anybody, however, if there is a requirement to wear a swim cap, it shouldn't take into account if you one is a male or female. Long hair is long hair no matter if you are a man or a woman, so if you have a swimming pool where they require swim cap, then everyone should wear one. I think that you should wear a cap half of the time. In practice, wear a latex, and in races, wear silicone, THey cut the water better. I dont think you loose more heat out of your head than your body when in open water (or any where). It's generally the fact that our head is not covered (possibly wearing a wet suit/clothes) best not to confuse heat lose, its the same on all parts of an exposed body. thanks for the insight. You are correct that head by itself is no more special in heat loss than any part of the body, but from what I understand if you are in cold water and rest of your body is working or is covered with a wetsuit, then your head is more prone to have higher heat loss percentage than normal. Ears are probably the most crucial part here as they have a lot of blood vessels.